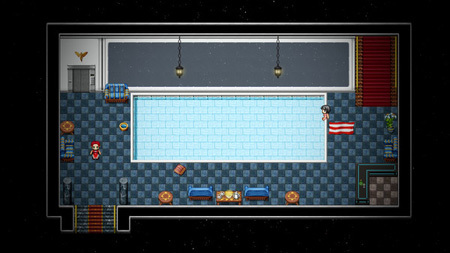 Space Pilgrim Academy: Year 3 is a unique space adventure game from Pilgrim Adventures. A mining fleet gone rogue on the edge of space. Dangerous figures emerging from the past. This year could be a killer. Following the startling discoveries of the previous school year, Maggie is just beginning to realise that she already faces significant challenges of her own. Her friends are there for her, but is there anyone who can help her to understand the true nature of her haunting visions? As Margaret Dale, attempt to balance your life at the academy with the emergence of new powers which you do not yet understand. As Gail Pilgrim, explore the flagship of the rogue mining fleet Elivagar and uncover the unsettling secrets hidden within. In the role of ambassador, you must attempt to convince the leaders to desist in their rebellion. Ambassador Gail Pilgrim must prepare to deal with the consequences of her actions during the Venus summit. Just when she least expects it, she is presented with an unusual offer that seems to good to be true and may bring her more trouble than she bargained for. If you get stuck in the game, check out the video walkthrough and gameplay for the game. This entry was posted in PC Games, Walkthrough and tagged Space Pilgrim Academy: Year 3 Action 1, Space Pilgrim Academy: Year 3 Cheats, Space Pilgrim Academy: Year 3 Game, Space Pilgrim Academy: Year 3 Gameplay, Space Pilgrim Academy: Year 3 Guide, Space Pilgrim Academy: Year 3 Hints, Space Pilgrim Academy: Year 3 Solutions, Space Pilgrim Academy: Year 3 Strategy, Space Pilgrim Academy: Year 3 Tips, Space Pilgrim Academy: Year 3 Walkthrough by Marvin. Bookmark the permalink.